A Well-Feathered Nest: Who wants mancakes? I think pancakes are quite possibly Jonathan's favorite food. Sometimes out of nowhere he will start saying, "Some mancakes, ma!" He has lots of words that don't start with the correct letter yet. When we ask him if he wants some pancakes, he gets all excited and sometimes just starts yelling, "Mancakes! Mancakes!" He did this in Cracker Barrell one night from the time we ordered until the waitress brought him his plate. The people next to us thought it was funny, but it gets old after a while. 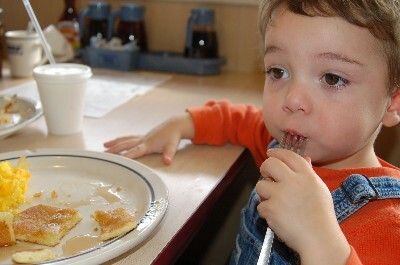 Soooo, his favorite restaurant is IHOP, and it just so happens that his daddy likes it to. We end up there at least once every other week lately, so everyone is happy. On another happy note, this week is off to a much happier start than last week. Jonathan is jabbering away and giving kisses. He still likes to say no a lot, but he did say he loves everyone we could possibly name. Well when we said, "Do you love..." he would answer, "Yesss." But before we closed his door last night, he did declare his love for Thomas and Spider Man all on his own.